COLUMBIA, S.C. - Three seasons of Columbia Fireflies baseball are officially in the books. The 2018 season - which began on April 5 at Spirit Communications Park and finished at SRP Park on September 3 - proved to be another wonderful campaign for the players, fans and the organization. 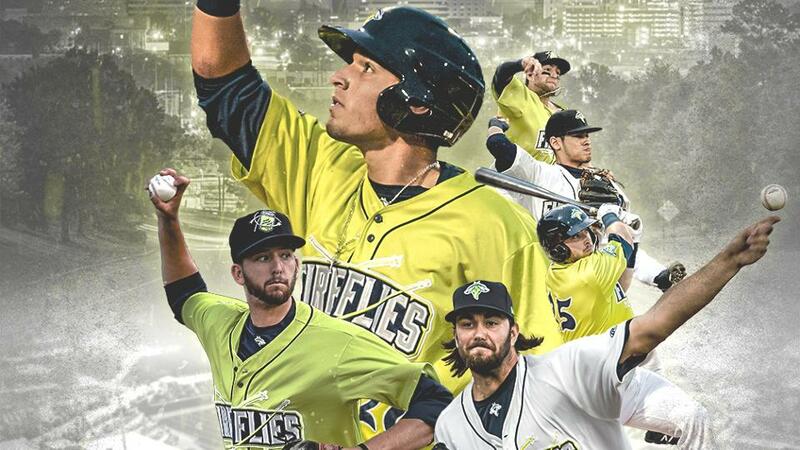 As has typically been the case, the Fireflies were again honored with numerous awards. This season, Spirit Communications Park was named the best playing field in the South Atlantic League. That was thanks in large part to the efforts of 2018 SAL Sports Turf Manager of the Year, Danny Losito. League managers and umpires made it abundantly clear that Columbia's field was the most outstanding in the league. As a result of his hard work, Losito was recently named first assistant groundskeeper for the University of Southern California, where he works on the Los Angeles Memorial Coliseum for Southern Cal football and the NFL's L.A. Rams. This spring and summer also saw the first wave of former Fireflies to reach the major leagues. Four players who had passed through Columbia - and as recently as just one year ago - fulfilled their lifelong dreams. The first was former South Atlantic League All-Star Merandy Gonzalez . The right-hander made his pro debut with the Marlins (after being traded from the Mets organization the prior year) in April. Left-hander P.J. Conlon would follow with a start for the Mets in May and soon after, pitcher Tyler Bashlor and outfielder Kevin Kaczmarski reached the Mets major league roster. On the field, the Fireflies proved to be a competitive team. Two former first round draft choices, Anthony Kay and David Peterson, called Columbia home for a portion of the 2018 season. Both received promotions to advanced-A due to their success with the Fireflies and Peterson would even go on to win the Mets Sterling Award for the class-A affiliate (the Sterling Award is given annually to the top Mets prospect at each minor league level). Peterson, the 20th overall selection in the 2017 MLB First-Year Player Draft out of Oregon, was unflappable in nine starts with the Fireflies and posted a 1.82 ERA. The Fireflies weren't only recognized for their work on the field. Marcel Renteria won the Mets' coveted Community Service Award. The pitcher volunteered on many occasions to visit with youngsters at the Palmetto Health Children's Hospital. Renteria also participated in scrimmages with Columbia-based special needs baseball teams and was always eager to sign autographs for fans. In addition, Renteria was a major asset throughout the season to the Fireflies staff, as he was able to bridge the language gap between the front office and Spanish-speaking Fireflies players. In fact, Marcel even led a focus group of our players to help develop logos and color schemes for the team's participation in Minor League Baseball's "Copa de la Diversión," or "Fun Cup." The Copa is a season-long event series specifically designed to embrace the culture and values that resonate most with participating teams' local Hispanic/Latino communities. The fans who passed through the gates at Spirit Communications Park were as passionate and energetic as ever. The highest-attended game in 2018 took place on July 4th. There were 9,278 fans in attendance for the Fireflies' Independence Day celebration, the second-largest crowd in park history. A spectacular fireworks display took place immediately after the game, sending fans home with smiles ear-to-ear. Jeremy Vasquez's Franchise-Record On-Base Streak - Columbia's opening day first baseman (who stayed with the club until a promotion in July) reached base safely in his first 29 games of the year (April 5-May 6). No one else in the SAL had a longer streak in 2018. Columbia's May Magic - The first week of May was perhaps the most exhilarating stretch of baseball in 2018. If walking-off in consecutive games on May 3 and 4 wasn't enough, the Fireflies saved their best late-inning performance for the 5th with the Lakewood BlueClaws in town. Down 7-3 in the eighth, Giovanny Alfonzo crushed a grand slam to tie the score. Quinn Brodey homered later in the inning and the Fireflies rallied for a miraculous win. Alfonzo's grand slam was the first by a Firefly at Spirit Communications Park. Raphael Gladu Streaks Past Everyone - The outfielder hit safely in a franchise-record 23 straight games from May 9-June 9. The Canadian tallied the longest hit streak in the SAL in 2018. Luc Rennie Strikes Out 14 - On July 22 against Augusta, starter Luc Rennie was unhittable and turned in, perhaps, the most dominant performance by a Fireflies' hurler. The 14 Ks were the most in a single game by a Fireflies pitcher. Hansel Moreno's Inside the Park Home Run - It had never happened in Fireflies history until Hansel Moreno stepped to the plate in the second inning against Augusta at SRP Park on July 28. Moreno bashed a pitch off the right-field wall and watched as it took a quirky carom into right-centerfield. Moreno whizzed around the bases and scored. Going Yard, 5x - The Fireflies mashed a single-game franchise-record five home runs on August 5 in Asheville (Matt Winaker 2x, Jose Brizuela 2x, Dionis Paulino). August was the month of the long ball for the Fireflies. At one point, Columbia homered in six straight games from August 12-19, another franchise record. Miranda's Drive for Five - Outfielder David Miranda became the third Firefly (Dan Rizzie 2017, Enmanuel Zabala 2016) to tally five hits in a game on August 13 against Delmarva. The Placentia, California, native finished 5-for-5 at the dish. Records were smashed as well. Columbia set new benchmarks for home runs (88) and punchouts (1241) in a season. Matt Winaker tied the single-season mark with 13 dingers and Tony Dibrell struck out a new Fireflies season-best 147 batters. Also of note, two 2018 Fireflies - pitchers Joe Cavallaro and Stephen Villines - both reached as high as the double-A level.